An advocate can help you or your young person be heard. 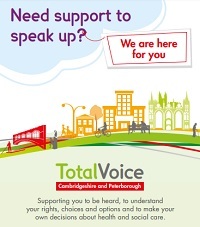 And in Cambridgeshire & Peterborough, the advocacy service is called Total Voice. Cambridgeshire County Council and Peterborough City Council have brought together all advocacy services for adults, carers, children and young people into one single contract. It’s a partnership of specialist advocacy organisations: VoiceAbility, Cambridgeshire Deaf Association and NYAS (the National Youth Advocacy Service).